Almost six square miles above Lake Wenatchee has now been protected for conservation. This is good news for our land and water, as well as hikers, bikers, skiers and equestrians. Chelan-Douglas Land Trust is now actively working with Western Rivers Conservancy, which stepped up and purchased the property in June, to identify the preferred permanent owner of this important forest land. In December, the Washington Department of Natural Resources (DNR) released a review of current and potential community forest projects across the state at the request of the state legislature. The DNR ranked Nason Ridge first among potential community forest projects, due in large part to the outpouring of support during the Save Nason Ridge campaign. Click here to read the DNR proviso report. Click here for more information about Washington's Community Forests. The $1 million contributed during the campaign could serve as the required community match for state funds. As you read this, the Washington State Legislature is considering legislation to establish a new community forests program, which could be great news for Nason Ridge. If Nason Ridge were designated as a community forest, state funds could make it possible for a local government or nonprofit to own the land permanently. Designation as a community forest would enable local control and local input, and could be just the right outcome for this beloved place. A forest plan, developed by our community, would determine how best to manage the land. Any benefits, whether economic, educational, recreational or environmental, would remain local. Nason Ridge is many things to many people. It’s a place to hike or mountain bike in the summer. It’s a place to ski in winter. It’s part of a cherished natural landscape rising above Lake Wenatchee. And it’s a part of the natural balance of Lake Wenatchee, the Wenatchee River and Nason Creek. Nason Ridge is also a property that was slated for timber harvest. But now, all 3,714 acres of this beloved property will instead be conserved—permanently. Families have been visiting “Big Red,” a giant ponderosa pine, generation after generation. Access is now protected, thanks to your help. In 2017-2018, Chelan-Douglas Land Trust partnered with Western Rivers Conservancy to help WRC buy and conserve this critical property. Western Rivers Conservancy now holds the land as interim owner, allowing for public use and enjoyment of the property while they identify the permanent steward of the land. This land will now be managed for the long-term health of the forest, Lake Wenatchee, and Nason Creek. The land will continue to purify the water that flows into our waterways. The trail system cherished by so many will remain. Lake Wenatchee's breathtaking views are protected forever. Petition signers grabbed the attention of Weyerhaeuser in the summer of 2017, stopping the road-building process. The volunteer fundraising team worked tirelessly to reach out to their friends and neighbors to let them know about this opportunity. The long list of endorsers who were willing to lend their name amplified the campaign. And of course, a huge thank you to all who gave – you made this possible. Thank you. Nason Ridge was originally part of the territory of the P'Squosa (Wenatchi) people. After becoming part of the United States, the land was owned by the federal government, then granted to Great Northern Railway in a checkboard pattern as an incentive to bring rail transportation to the West. Just prior to the Great Depression, the land was sold to Schmitten Lumber Company, who left the land unlogged. 1973: Schmitten Lumber Company was bought by Pack River Lumber Company and the checkerboard pattern was consolidated in land exchanges with the US Forest Service. Post-1973: The land changed ownership and was logged multiple times after 1973, and was eventually owned by Longview Fibre. 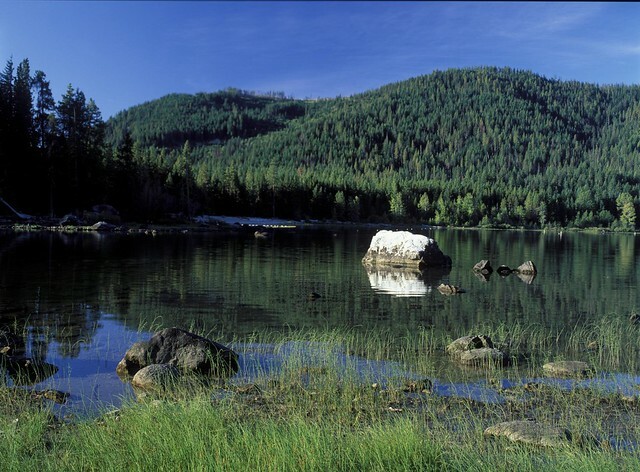 2000: Chelan-Douglas Land Trust mediates a compromise to improve forest health. In the spring of 2000, Longview Fibre announced plans to harvest 310 acres of timber on Nason Ridge. The proposed harvest alarmed Lake Wenatchee property owners who feared that the aesthetic, environmental, and recreational qualities at Lake Wenatchee would be compromised. Lake Wenatchee residents sought the Land Trust’s help to protect Nason Ridge from the proposed harvest. CDLT helped to mediate a compromise between Longview Fibre and the Friends of Lake Wenatchee Forests. As a result, Longview substantially modified their harvest plans to address the local concerns. Longview’s positive, responsible approach to addressing citizen concerns was an outstanding example of how a conflict can become a win-win situation if both sides are willing to listen, learn, and find common ground. 2008-2010: CDLT and Trust for Public Land attempt to purchase Nason Ridge. After being purchased by Brookfield Asset Management in 2007, Longview Fibre put 3700+ acres up for auction as part of their plan to divest of eastern Washington holdings. Concerned local citizens contacted the Land Trust. The property was not sold at auction, but remained on the market. From 2008-2010, the Land Trust convened community members, conservation organizations and stakeholders including the State Park seeking negotiations to purchase the property in a phased and piecemeal approach. 2009: Longview pulled out of negotiations and attempted to sell the property through auction again, with a desire to sell the land as an entire unit. The property did not sell at auction. 2012: The property was again offered by auction in July, but not sold. 2013: Weyerhaeuser acquires Longview Timber LLC in July, thereby acquiring Nason Ridge. 2015: CDLT begins Upper Wenatchee Community Lands Plan and identifies Nason Ridge as a priority for protection. August 2017: Weyerhauser acquires a permit to log almost all the trees on 210 acres on the slope above Lake Wenatchee. Nearby landowners – concerned about views, unstable slopes, impact on water quality, and the severity of the harvest, started a petition to express concerns about the proposed logging. Weyerhaeuser listened, and agreed to pause the timber harvest and allow some time to craft a permanent conservation outcome for the property. The Chelan-Douglas Land Trust and Western Rivers Conservancy began working towards purchasing the property.